From the Southernmost Tip of Africa to the tables of households around the globe! This is the success recipe for an Afrikaans recipe book which got the world cooking as far as the USA, Canada, Australia, New Zeeland, the Netherlands, Abu Dhabi, Kenya, Namibia and all over South Africa. 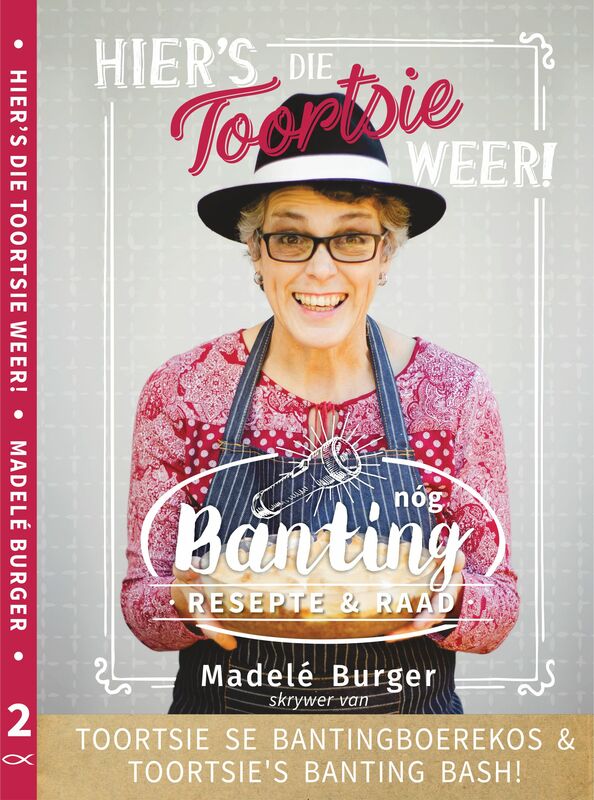 “Toortsie se Bantingboerekos” is an informal easy to use recipe book focused on traditional South African dishes adapted into low carb, healthy fat requirements by Bredasdorp debut author, Madelé Burger. With its unexpected popularity this colourful kitchen friendly recipes supplemented with traditional cooking wisdom has just been reprinted for the third time. 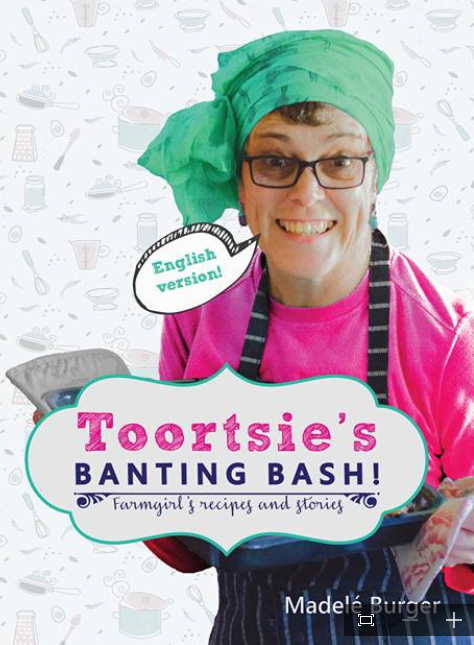 According to Madelé the secret of “Toortsie” as her Banting cooking made easy recipe book has been pet-named by the industry, lies in tasty recipes which are popular amongst the Banters and non-Banters found in every family. In addition to the demand for copies of her book Madelé’s eat pan and lifestyle recommendations may be read in her weekly contributions to the Feel Good blog of Finesse magazine as well as on her blog Toortsie.com. She is also writing a monthly article for fellow Bredasdorp Banter Esther Möller’s brand new low carb e-directory, www.lowcarbdirect.net. Madelé’s 140 page book with 60 recipes and stories about the journey of her life has recently been translated into kitchen friendly English by Marius Swart, a translator at the University of Stellenbosch who also hails from Bredasdorp. Photography and photo editing has been done by Lize du Toit with photo styling by Lizelle du Toit. Lieze Swart did the page layout. According to Madelé’s promise on her website and on Toortsie’s facebook page at https://www.facebook.com/bantingboerekos/ Toortsie’s Banting Bash! is on its way to the printer and would most probably be published before the end of July. “Toortsie se Bantingboerekos” was born in July 2014 when Madelé struggled to get easy recipes with ordinary ingredients after she decided to change her own lifestyle into the internationally renowned low carb, healthy fat meal plan. “To get to meals with items readily available in my own grocery cupboard I adapted our traditional known family meal recipes into Banting friendly dishes. Ordinary food with easy recipes,” she says. Over the past few months “Toortsie se Banting Boerekos” became a family favourite in households globally where this lifestyle is making a positive change in the lives of men and women, young and old. “Inquiries are is received from across the globe especially via Afrikaans families with family and friends abroad. Although my “Toortsie” is only available in a few Western Cape shops, it is through social media and word of mouth that mail deliveries across the country and the world are increasing daily,” says Madelé. She is a South African farm girl who are involved with the administration of their own farm in the Overberg. Earlier she worked as a teacher and manager of Katlou Transport. She has three children and two grandchildren. Madelé is very fond of music and she often plays with the worship team in her congregation. “My personal dream remains to be the best wife to my husband and the best mother and grandmother. “By means of projects such this little recipe book I am living life to the full. I am very excited about “Toortsie” speaking English now, since this was a humble idea which surpassed my wildest imagination. I trust that the English version will be of help to many more people worldwide,” says Madelé about the unexpected success of her personal lifestyle passion for her own family. Dis awesome Toortsie – jy bors swel seker van trots!! Ek weet myne sal! Dis beslis nie enige aap wat ‘n boek (van enige aard) die lig kan sien nie. Dankie. Mens mowt net laf genoeg wees dan kry jy dit reg! Dis nogtans bloedsweet, commitment and baie harde werk. Uithou en aanhou. En natuurlik moet mens die reis geniet. I am sending this link to my NZ friends who are interested in cooking, baking and low carb diets. Well done dear Toorts! Thanks I’ll let you know what they say.